Remember the anticipation of that first kiss? This assembled sculpture captures the moment as two porcelain cherubs close their eyes and pucker up for their first kiss. Sometimes I buy pieces when I cruise the thrift shops and I don’t know what the heck I’m going to do with them, hoping inspiration will strike. I found the cherubs and thought they were kinda cute. But I’m not a person who accumulates “cute things.” But there was something about the youthful anonymity of these cherubs that captured me. Maybe their upturned faces were expecting the Heavenly Host, but I thought they were anticipating a kiss. So much for my imagination. I also had the big vase which was turning out to be more difficult to use than I thought. So I turned it upside down and it became the base for the totem. 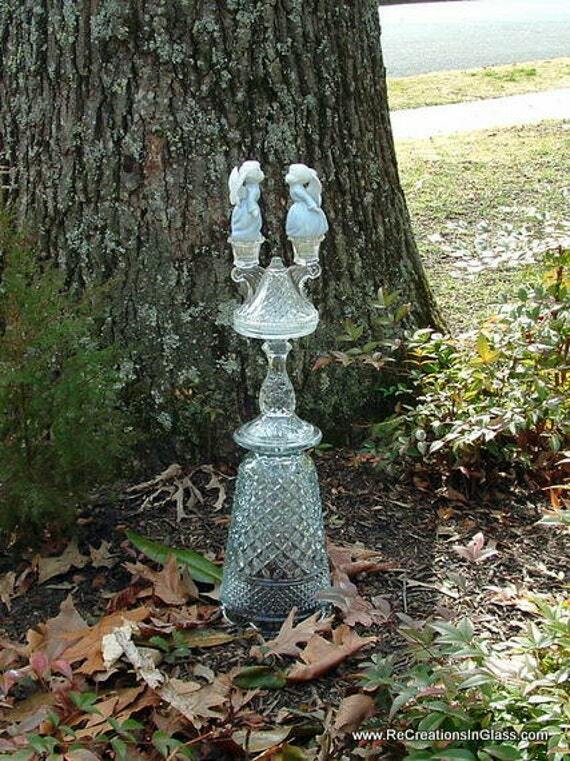 I find a lot of pretty double candle holders, so I perched the cherubs on one of those. Then it needed some transition pieces, and voila, I had a whimsical garden totem. It makes me smile when I look at it. I hope it does the same for you. weighs 6 pounds 15 oz. This item is available for purchase. If interested, please click this link to my Etsy.com store.